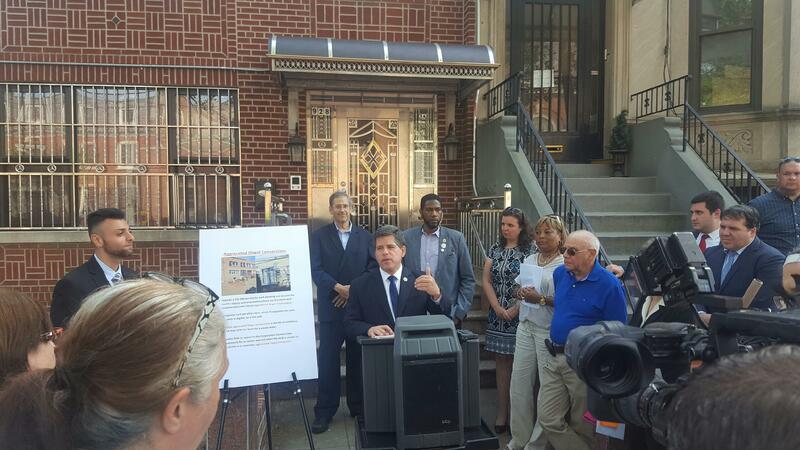 Council Member Gentile holds rally on new illegal conversation bill. Image Credit: Council Member Gentile’s Office. Proposal imposes steep fines on bad actors, and helps Buildings inspectors gain premises access. On June 21, 2016, New York City Council Members Vincent J. Gentile, Jumaane D. Williams, and Barry S. Grodenchik introduced legislation that would impose high penalties on bad actor landlords and equip the Department of Buildings with means to gain entry into suspected illegal conversion sites. This bill was developed with the support of Brooklyn Borough President Eric Adams, after a November 2014 fire in an illegal unit above a Flatbush church killed an individual and injured 16 others, destroying the building. Introduction 1218 (2016) would establish a fine of at least $45,000 for aggravated illegal conversions — $15,000 for each unit — and expand the authority of the New York City Department of Buildings and the New York City Environmental Control Board (ECB) to inspect properties and impose fines and other penalties. An aggravated illegal conversation is defined as three or more illegal dwelling units being created within one structure. The aggravated illegal conversions bill provides that fines imposed by ECB automatically create liens that, if unpaid, could be included in a lien sale, and adds aggravated illegal conversions to the list of offenses for which a vacate order could be issued due to immediately hazardous conditions. Additionally, if inspectors from Buildings fail to enter the premises after several attempts, this bill creates a procedure for the Buildings to request a warrant for entry from the Law Department. Although the rally was held in South Brooklyn, Council Member Gentile made it clear to Cityland that illegal conversations are not just a local issue, and that this new bill will help combat this citywide problem. Additionally, Council Member Gentile has sponsored two other illegal conversion bills, introduced in 2014, and he has urged the Committee on Housing and Buildings to consider these bills as a package with the new aggravated illegal conversions measure. (Read CityLand for past coverage here). By: Brian Kaszuba (Brian is the CityLand Editor and New York Law School Graduate, Class of 2004).